Glasgow-based Clearwater is considered one of the UK's leading waste management providers. Covering many major towns and cities across England and Scotland, the company's fleet consists of various machines, including articulated haulers, tracked and wheeled excavators, and backhoe loaders. When Clearwater wanted to offer a customer a more cost-effective service by increasing an articulated hauler's productivity, they knew exactly where to turn: Terex Trucks. "One of our customers was contracted to work at a large recycling and resource management facility in East Ayrshire," says Graeme Hughes, Clearwater's contracts manager. "As such, they needed a 30-tonne class articulated hauler with a high capacity waste body. 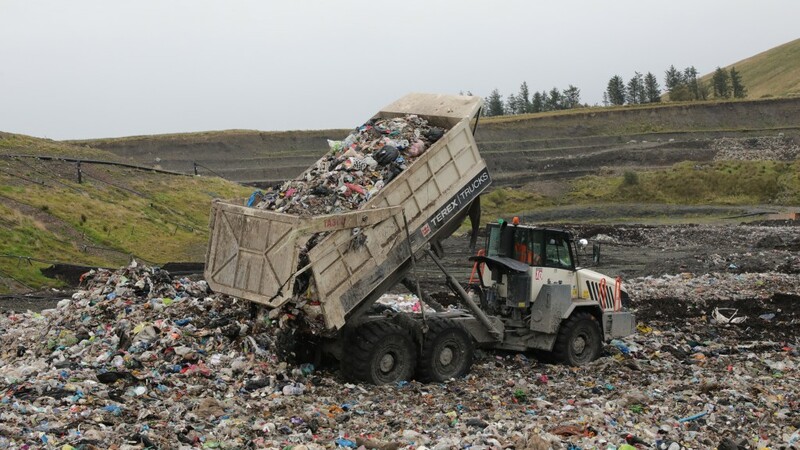 We discussed this with Grant Maclaine from TDL Equipment -Terex Trucks' UK dealer - and quickly established the Motherwell-based factory could design and build a bespoke dump body for us." "Given that waste material is generally much lighter than muck or quarry stone payloads, we were able to increase the TA300's standard heaped carrying capacity from 17.5 m3 (18.9 yd3) to an impressive 27.7 m3 (30.3 yd3) - which equates to an estimated payload of just 12 tonnes (13.2 tons) of low density waste," says Grant Maclaine, TDL Equipment's regional sales manager for Scotland. "This additional carrying capacity helps to lower the cost per cubic metre moved. We also added a large dump body canopy, similar to that found on a rigid hauler, to increase safety." "Taking everything into consideration - operator comfort, price, performance, and service backup - we had no hesitation in placing an order for a Terex Trucks articulated hauler with TDL," says Graeme. "With our customized machine, we're able to unload in around 12 seconds. In our line of work, that's almost unheard of. Thanks to its additional carrying capacity, we've also been able to reduce site traffic, fuel consumption, as well as the total cost of operation. We're blown away by how much this hauler is capable of." "From start to finish, the TA300 modification project took just two months to complete," says Guy Wilson, Global Sales Director. "We're thrilled that the customer is happy with the final result. Not only is the TA300 robust, but it's also versatile. This isn't the first modification project we've been a part of. At Terex Trucks, we're committed to customer satisfaction - and depending on the project at hand, that might require some special adaptions here and there." Thanks to the fully enclosed, oil-cooled, multi-disc brakes at all six wheels, the TA300 is perfectly suited to applications in which there are exposed moving parts - such as at a recycling and resource management facility. Secondary braking is supplied by both the engine brake and the transmission retarder, giving the operator maximum control. This provides improved safety and stability, as well as reduced cost of operation and minimum brake wear.